Lewes is still quite well supplied with public houses, but there were once far more of these foci of civic life than there are today. In many cases the old inn buildings survive, converted to other uses, though some have disappeared altogether. John Davey is the son of Leslie Davey, whose books on Lewes history included ‘The Street Names of Lewes’ (1961), ‘The Inns of Lewes, Past & Present’ (1977) and ‘The Story of the Lewes Victoria Hospital’ (1981). All three of Leslie Davey’s books were published by the Friends of Lewes, amongst their many valuable contributions to understanding the development of our town. John’s talk will be illustrated. As usual all will be welcome, and we will be serving coffee and biscuits before the meeting. 2. The Great British Story: Lewes: Sunday 24 June 2012, 11 am-4 p.m. This Lewes History Day, taking place at various locations in the town, is being sponsored by the forthcoming BBC ‘Great British Story’ series. There will be two main talks at the All Saints Centre by Prof John Blair of Queens College, Oxford on ‘Lewes before Lewes’ at 11.30 a.m. and Kim Clark on ‘The Street Names and Twittens of Lewes’ at 2.00 p.m. In between there are films about Tom Paine by Artemis Arts. Entry to the talks requires a (free) ticket, available in advance from www.bbc.co.uk/showsandtours/events or 03709 011277. Also at All Saints Sarah Hitchings, Jenny Stewart and Sue Weeks will be presenting a ‘Lewes Streets’ foyer exhibition. Uncover more about the battle of Lewes, the Phoenix Iron & Steel Works, and discover the meaning of your surname with the Census Detectives. Enjoy a choir performance from Phoenix Cantata ‘Choral Work of Sussex’ or participate in one of John Bleach’s historical walking tours of Lewes. Discover a wealth of historical documents and learn about preserving your family treasures. Westgate Chapel tours of old ‘secret library’ (12.30 – 3pm) and visits to the Tom Paine printing press nearby. 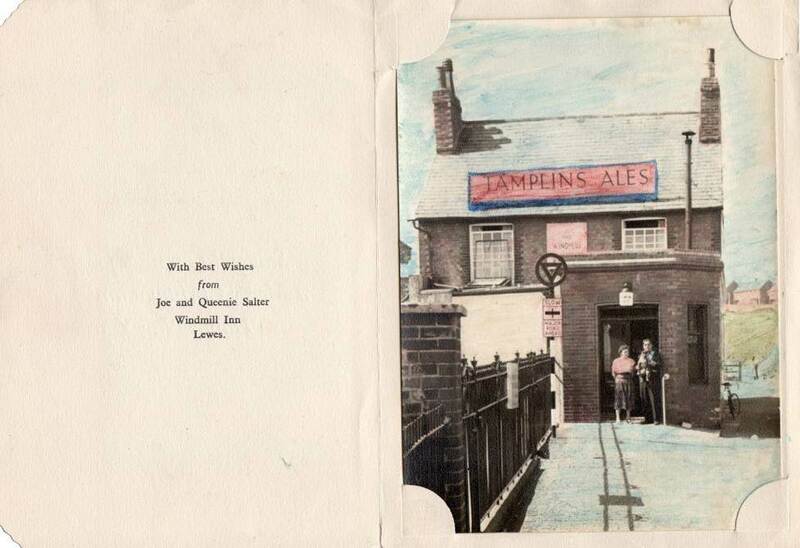 The Windmill Inn, Spital Road, is one lost Lewes inn that many readers will remember. I lived there circa 1947-53. I attach image of a Christmas card my mother and step-father sent out. My step-father, Joe Salter, hand-coloured them. The dog is bull terrier, Carla. This is the only image of the Windmill Inn Bob Cairns has ever seen and it may be the only one in existence. If any person on any public coach or other public carriage for the conveyance of passengers or on any coach, brake, waggonette, or any other vehicle hired or used for the conveyance of pleasure parties and the like (a) shall blow any horn or use any other noisy instrument or make or combine with any other person or persons to make any loud singing or outcry while passing through the Borough to the annoyance or interruption of residents, or (b) shall while passing through the Borough throw any money to be scrambled for by children or other persons on the road or footway, such person shall be liable on summary conviction to a penalty not exceeding £5 for each offence; and the conductor (if any) employed on the vehicle and the person who had engaged or obtained the use of the vehicle on the occasion of which the offence was committed shall be liable to the like penalty unless he proves that he took no part in and was unable to prevent the offence, and that he had been given all the information in his power as to the person or persons by whom the offence was committed. “Malling Church is a simple fabric, consisting of a nave only, and stands at a considerable distance from the population. It was erected in 1628, under the will of John Stansfield, esq, who endowed it as a perpetual curacy, and one of the foundation stones was laid by his afterwards eminent grandson, John Evelyn, author of ‘Sylva’, etc, who records the circumstances in his ‘Diary’. 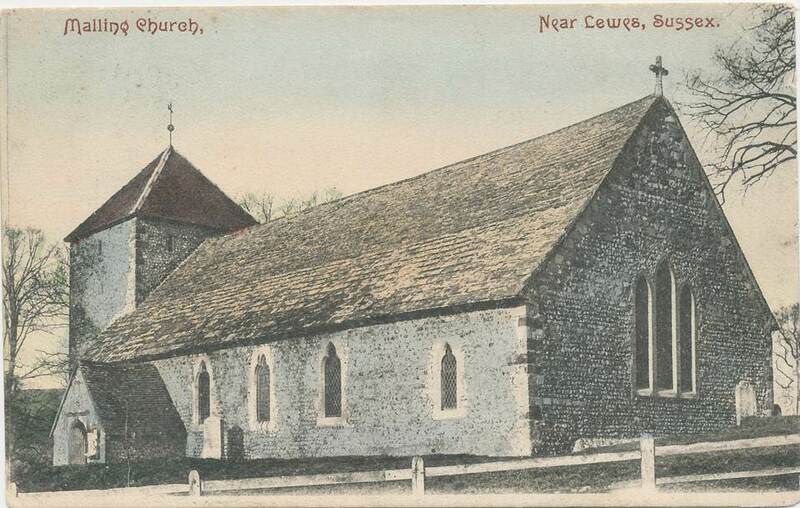 This picture of South Malling church is taken from an Edwardian postcard published by the Mezzotint Company, Brighton. My copy, postmarked 1906, has a message on the reverse “Shall go to this church next Sunday if all’s well”. At the start of the war, building work on the initial plan for a council estate on a site known as Landport, Lewes, was still in progress. The estate site stretched from Arundel Green, at one end to some fields, adjacent to Landport farm, at the other. The farm was on the edge of some woods, through which a twisting country path led to Offham Church. The land between Arundel Green, Offham Road and Wallands Crescent was occupied by allotments. A stony lane that left the Offham Road near the Wallands led down past the allotments and was joined some way down by a twitten leading, via a clattery railway footbridge, to Pelham Terrace and The Pells. Mr and Mrs Weller and their son Peter lived on the estate in a recently-built house at one end of Lee Road. Mr Weller was conscientious by nature and short in stature. He had a deformed leg which caused him some difficulty in walking. We did not know whether he was born with the deformity or suffered it as the result of some accident. Despite boyhood curiosity, we felt it was impolite to ask and might cause him some distress and embarrassment so the subject was not mentioned. We wondered, though, if it was just coincidence that he was a cobbler by occupation. Peter was similar in age to me but went to St Pancras rather than The Pells because he was a Catholic. Ronald and I had moved to new school premises, St John’s Parish Hall, in Talbot Terrace but Maurice, being older, had transferred to Mountfield Road School. Next door to the Church Hall was a bakery where cakes and buns were made for a shop at the top of steps leading from Talbot Terrace. Ronald and I helped out by offering to carry trays of freshly made cakes from the bakery to the shop. Our reward was a cake when we reached the shop but, just in case they forgot about this arrangement when we arrived there, we contrived to help ourselves to a cake on the way up and consume it before reaching the shop. It was sometime before we realized that it was possible to see the cakes being carried up, from a window at the back of the shop premises. At school with Ronald and me was a boy we called Robbie. He and his parents lodged with his grandparents, in a house with a Dutch-barn roof, in Lee Road just a few yards from us. His parents had decided on a private evacuation from their home in Greenford, Middlesex, at the start of the war. Being London-born seemed to justify Robbie’s schooling with us. In time, Robbie took on the status of a brother. He was with us during the ‘horse-incident’. One day, on the way to school, we had just reached the stony lane leading from the estate when we encountered two people on horseback. As they approached, riding side by side and leaving little room for us to pass, an inborn fear of animals larger than myself turned to panic when one of the horses became agitated and I took avoiding action by springing over a low stone wall at the side of the lane into an adjoining field. Fortunately, some brambles broke my fall and I escaped with minor cuts and grazes but I did need some help to find and recover my gold-rimmed spectacles from the bushes. Mr and Mrs Weller made us feel at home and life with them was happier than it had been in our previous foster-homes. Mr Weller left home at the same time each weekday carrying a satchel containing some food and a medicine bottle filled with milk for the mugs of tea he made throughout the day. He trudged up the stony lane, then into town to his little shop at the top end of Market Street, not far from the War Memorial. Diagonally opposite the shop was a council building housing the school’s dreaded dental clinic. In the other direction, a shop selling items of military interest had a window display that included campaign medals and a tailors’ dummy clothed in a soldier’s tunic. Mr Weller’s shop itself was a delight. On the front bench, where he worked shaping leather soles with a sharp curved knife and stitched torn riding boots, there was a higgledy-piggledy pile of boots and shoes of all styles and sizes. Despite the apparent chaos, Mr Weller was able always to pick out the right footwear for an owner calling to collect it. From time to time we visited the shop towards the end of a day and waited while Mr Weller finished off a job before walking home with us. Seated on small stools we played the game of ‘I spy’ by the light of a gas flame. Looking around the shop for inspiration I would cast an occasional anxious glance at Mr Weller to see if he was in danger of swallowing any of the handfuls of nails he was storing in his mouth before hammering them into a needy sole. Christmas 1939 was eventful. Among the presents were a pair of roller skates for Ronald and a football and boots for me. Outside, we tobogganed in the snow on sloping ground by some allotments close to the Tally Ho Public House. A possible reason for the name of this place became clearer when we saw some huntsmen with hounds in the vicinity of Offham Road on Boxing Day. Despite the care and comfort given by Mrs Weller, we missed our parents. When they came to see us there was an outpouring of emotion. On one occasion, even before they arrived at the house, I locked myself in the bathroom so that nobody would see me and cried. I am not sure why we left Lee Road. Perhaps Mrs Weller found that looking after three extra boys was just too much for her. Our next foster-home was to be with Mr and Mrs Collingham, and son David, in St. Peter’s Place. 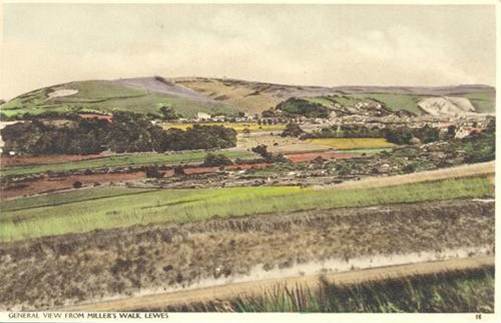 This postcard view, probably taken between the wars from what is now Hill Road but was then the Miller’s Walk, shows in the foreground the Offham Road. The grassy downland bank beyond the Offham Road is now the Landport housing estate, while in the distance are Malling Brooks. Below is a picture of an old water tank in the loft of a Nevill Estate house in Hawkenbury Way built for prison officers. 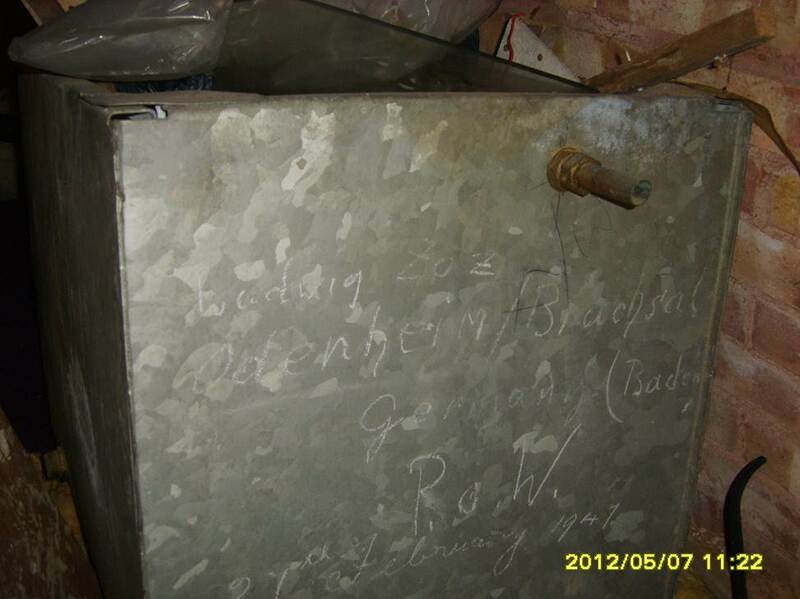 If you look closely you will see that the name of a German prisoner of war was scratched into it in 1947! The prisoners were presumably used to help build the houses. We have also been told that Lewes prisoners decorated the houses in the 1960s. Do you have evidence in your house or loft that would add to our knowledge of the estate? Do you have a story to tell? We would love to hear from you. Perhaps you would like to join our research group? If so, please contact: Ann Holmes [annholmeslewes@yahoo.co.uk] or Sarah Hitchings [sarahhitchings@live.co.uk]. This entry was posted in Biographical Literature, Economic History, Family History, Lewes, Local History, Transport History. Bookmark the permalink.